How the Search Committee Found Rebecca Chopp. President-designate Rebecca Chopp addresses members of the College community on Feb. 21, the day she was selected by the Board of Managers to be Swarthmore's next president. 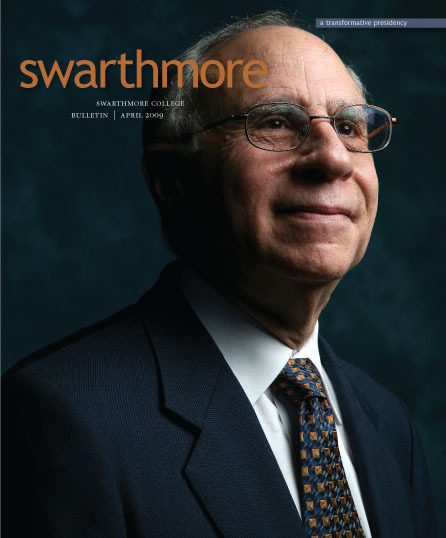 In an interview with the Bulletin on Feb. 24, three days after the Board of Managers selected Rebecca Chopp as the College’s 14th president, search committee chair Thomas Spock ’78 described the applicant pool as “broad and deep.” Swarthmore’s presidency attracted many applicants. Here’s how the choice was made. Bulletin: How were the members of the search committee chosen? Spock: [Board Chair] Barbara Mather [’65] consulted with other Managers and looked at historical precedent before deciding on the composition of the committee. She settled on four Managers (in addition to herself), three faculty members, two students, one other alumnus, and one member of the College staff. Barbara appointed the Board members and the staff and alumni representatives. The Committee on Faculty Procedures selected the three faculty members—one from each of the academic divisions—and the students were appointed by the Student Council. Were they expected to represent their own constituencies? The Board’s charge to the committee stipulated that although we wanted representatives from all major College constituencies, these members were not appointed to advocate the interests of their own constituent groups but rather to consider the interests of the entire College community. They did that without fail. In fact, all of the committee members performed admirably and put an enormous amount of effort into the search. We became an extremely tight-knit group, able to trust each other implicitly while feeling free to express our honest opinions. Why did the search committee observe such strict confidentiality? At Swarthmore, it’s in our nature to get input from as many people as possible, and every committee member chafed under the need to keep our work so confidential. The idea of an open process, with a parade of candidates making public appearances, is very attractive in theory. But in reality, the candidate pool we wanted did not allow for that. You cannot attract high-profile candidates if it’s known that they are pursuing a new job. None of the strongest candidates in our pool would have applied had we not promised confidentiality throughout the process. Can you describe the pool of candidates? Was there sufficient diversity? We had applications from more than a dozen sitting presidents of other institutions. There were provosts and deans from the biggest-name colleges and research universities in the country. It was very gratifying that Swarthmore was attracting this caliber of people. From the very beginning, we did everything possible to make sure we had a very diverse pool. In this we were successful enough that we felt we had the luxury of sitting back and deciding on the best person without worrying about race, gender, or ethnicity. How did you narrow the field? In October and November, we thoroughly discussed about 90 applications from the best-qualified candidates, eventually identifying about a dozen whom we wanted to interview in person. And for two days in December, the entire committee conducted 90-minute interviews with each. We then made a lengthy series of reference calls. We talked with board chairs, faculty members, students, colleagues—anyone who could tell us more about how they worked and were regarded in their institutions. We ended up with three finalists, each of whom we felt was fully qualified to be Swarthmore’s next president. Were the finalists seen by anyone outside the search committee? At this critical point, we knew we needed input from other members of the College community. Each finalist met for 90 minutes with a panel of 13 faculty members and for an hour with a group of 10 students. Members of the search committee observed these meetings and thoroughly debriefed the panelists. The final three also met members of the president’s senior staff, who were in turn debriefed by the committee. By the end of this process, each finalist had met with about 45 members of the College community. When did it appear that you had reached consensus about Rebecca Chopp? After all of these meetings with members of the community, the search committee met one last time with each of the three finalists, then began to deliberate. We had three very strong candidates, each of whom would have made a great president. But it didn’t take long to reach a consensus that we had someone special in Dr. Chopp.